St Vitus was the son of a pagan Sicilian senator who became a Christian under the influence of his Christian tutor Modestus and his Christian nurse Crescentia and suffered martyrdom along with them (See image). He is an example of how certain themes strangely become associated with the lives of saints. Patrick Duffy tells what is known about the him and how he became the patron of dancing. Vitus is best known as the saint to invoke for those suffering from epilepsy and nervous diseases. St Vitus’s Dance – also called Sydenham’s chorea (= dance) and Huntington’s chorea – is one of a series of abnormal movement disorders known as diskinesias. The saint is also invoked for similar diseases that come from the bites of mad dogs and snakes. By transference he has also come to be the patron saint of dancers. The tradition is that Vitus was the son of a pagan Sicilian senator called Hylas. He was given to a tutor called Modestus and a nurse called Crescentia, who brought him up as a Christian. His father tried to re-convert him to paganism, but was unsuccessful and then had the three of them arrested and scourged. They escaped to Lucania in mainland Italy and reached Rome. Here Vitus healed the emperor Diocletian’s son, who suffered from an evil spirit. But the cure was regarded as sorcery and all three became martyrs. It is not possible to say how true any of this is. 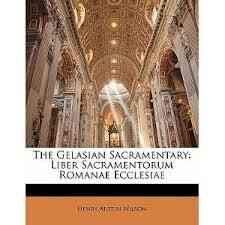 However, by the sixth or seventh century, Vitus is associated with bodily health in one of the earliest versions of the Roman Misssal, The Gelasian Sacramentary. By the 16th century Germans believed they could get a year’s good health by dancing before the statue of Saint Vitus on his feast day. This dancing developed almost into a mania, and was confused with the nervous disease with the saint being invoked against it. But that connection with such manic “dancing” led on to his patronage of dancers, and later of entertainers in general. 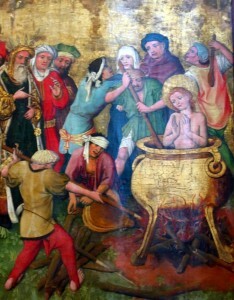 St Vitus is also grouped among the Fourteen Holy Helpers – among them, Barbara, Blaise, Catherine of Alexandria, Christopher, George, and others – that enjoyed a collective cult in the Rhineland from the 14th century.